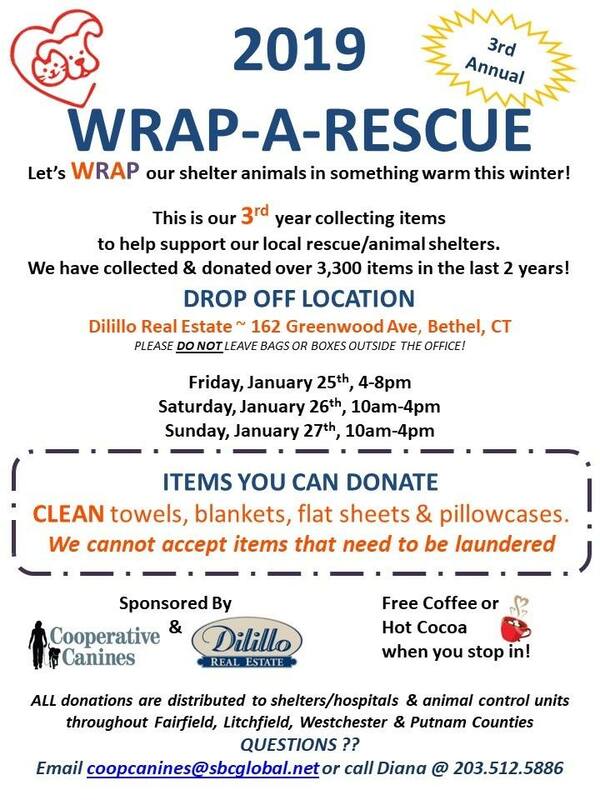 Let’s WRAP our shelter animals in something warm this winter! Help support your local animal/rescue shelters. Animal shelters need clean towels, blankets, pillowcases (nothing needing to be laundered) to be used for rescue/shelters in the area. All donations are distributed to local animal shelters, hospitals and control units throughout Fairfield, Litchfield, Westchester and Putnam counties. Have a question? Contact Diana at 203-512-5886 or email her at coopcanines@sbcglobal.net. Sponsored by Cooperative Canines and Dilillo Real Estate.